KANSAS CITY, Mo. -- Ryan Succop kicked a 53-yard field goal into the wind as time expired Sunday to give the Tennessee Titans a 19-17 victory over the Kansas City Chiefs on a frigid afternoon at Arrowhead Stadium. Succop, who spent the first part of his career with Kansas City, came up short on his first try at the winner, but Chiefs coach Andy Reid had called a timeout just before the snap. Given a second chance, Succop knocked it through with a couple feet to spare as the Titans poured off the bench to celebrate. The Titans’ rallied from a 17-7 hole, and Derrick Henry’s second touchdown got Tennessee (8-6) within 17-16 with just over three minutes left. But Titans coach Mike Mularkey went for the 2-point conversion and the lead. Marcus Mariota was pressured immediately and his pass never reached the end zone. But the Chiefs (10-4), trying to clinch a playoff spot, were unable to run out the clock and Tennessee got the ball back with a minute left. With no timeouts, Mariota calmly found Rishard Matthews for 19 yards and Delanie Walker twice to set up Succop’s field-goal attempt. Tennessee is tied for the AFC South lead with Houston. HOUSTON -- Tom Savage threw for 260 yards after Brock Osweiler was benched in the second quarter, and Lamar Miller scored Houston’s only with less than three minutes remaining. Jacksonville fired coach Gus Bradley after the game. The win was Houston’s 10th straight in the division and left the Texans (8-6) tied with Tennessee for the AFC South lead. But Houston controls its playoff future with a 5-0 mark in the division. Osweiler threw interceptions on consecutive drives in the second quarter to help Jacksonville build a 13-0 lead. Coach Bill O’Brien had insisted all season he hadn’t thought about benching Osweiler, but he’d seen enough after that and brought in Savage. The move was met with a huge ovation from the home crowd that had been booing Osweiler for most of the day. The Jaguars got the ball back twice after falling behind, but they failed on a fourth-down conversion the first time and Blake Bortles was intercepted the second time. Bortles threw for 92 yards and ran for a touchdown for the Jaguars (2-12), who dropped their ninth straight. DENVER -- Tom Brady overcame a slow start to lead the Patriots to a rare win in Denver, dealing a crushing blow to the Broncos’ playoff hopes. Brady missed his first six passes for just the second time in his career; the first was way back on Oct. 12, 2003, against the Giants. But he came back to lead the Patriots (12-2) to a record eighth consecutive division title and a first-round bye. The result was just his third win in Denver in 10 tries, and it was the Broncos’ hopes of defending their Super Bowl title that took a beating. The Broncos (8-6) lost for the third time in four games and were supplanted by the Dolphins for the sixth and final playoff spot in the AFC race with two weeks remaining. SAN DIEGO-- Sebastian Janikowski kicked a 44-yard field goal with 2:40 left, his fourth of the game, and the Raiders beat the Chargers in the Relocation Bowl to clinch a playoff berth for the first time since 2002. Playing before what looked like a home crowd at 70,000-seat Qualcomm Stadium, the visiting Raiders (11-3) earned a playoff nod on the same field where they made their last postseason appearance, an embarrassing 48-21 loss to Tampa Bay in the Super Bowl on Jan. 26, 2003. There was a surreal atmosphere to the game, which might be the Chargers’ second-to-last in San Diego. Team chairman Dean Spanos seems almost certain to move the Bolts (5-9) to the Los Angeles area after failing to get a big public subsidy to help him replace aging Qualcomm Stadium. 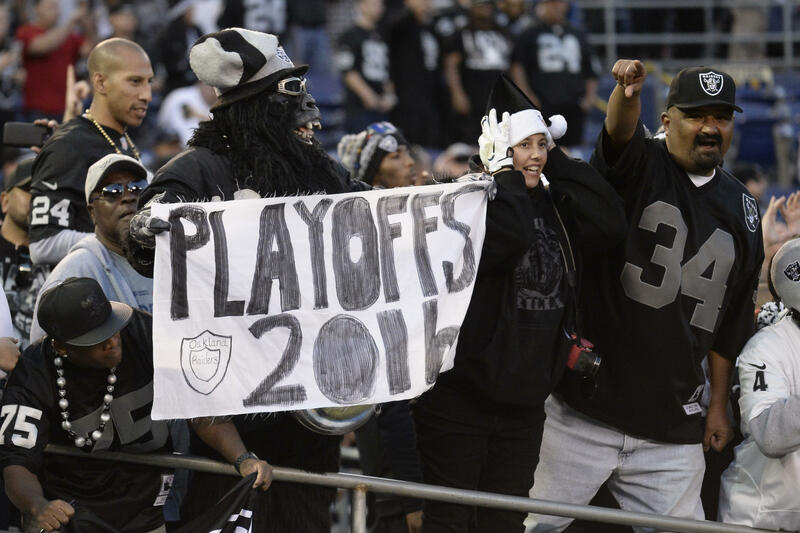 The Raiders could be on the move, too, with owner Mark Davis eyeing Las Vegas, although they’d still play in Oakland until a new stadium is built in Sin City. CHICAGO -- Aaron Rodgers hit Jordy Nelson with a 60-yard pass to set up Mason Crosby’s 32-yard field goal as time expired in one of the coldest games ever played in Chicago. Wide receiver-turned-running back Ty Montgomery ran for a career-high 162 yards and two touchdowns, and the Packers (8-6) earned their fourth straight victory despite blowing a 17-point lead in the fourth quarter. They also moved ahead of Minnesota for second place in the NFC North and pulled within a game of division leader Detroit. The Bears (3-11) tied it on a field goal by Connor Barth with 1:19 left. The Packers took over at their 27, and on third down at the 26, Rodgers unleashed a deep pass down the middle of the field to Nelson, who got behind Cre’Von LeBlanc. The game-time temperature was 11 degrees with a minus-4 wind chill. Chicago hosted the Packers in 3-degree temperature and a minus-15 wind chill - the lowest ever for a Bears home game - on Dec. 18, 1983. The Bears’ coldest home game, temperature-wise, was against Green Bay on Dec. 22, 2008, when it was 2 degrees with a minus-13 wind chill. The Packers tied the NFL’s oldest rivalry for the first time since 1933 at 94-94-6. ORCHARD PARK, N.Y. -- The bumbling Browns are two losses short of becoming the NFL’s second team to go 0-16 in one season. LeSean McCoy had a season-best 153 yards rushing and scored twice, and the Bills kept their slim playoff hopes alive. The Browns dropped to 0-14, matching the second-worst start to a season set by the 1976 Tampa Bay Buccaneers and 1980 New Orleans Saints. The 2008 Detroit Lions , meanwhile, are the NFL’s only team to go without a win in a 16-game season. Cleveland has also lost 17 straight dating to last year, moving into a tie with the St. Louis Rams (2008-09) and Houston Oilers (1982-83) for the league’s sixth-longest skid. The Browns have now gone a calendar year since their last win, a 24-10 victory over San Francisco on Dec. 13, 2015. The Browns have been so bad they haven’t had a lead in 17-plus quarters, dating to a 7-6 edge in the third quarter of a 28-7 loss at Baltimore on Nov. 10. CINCINNATI -- Chris Boswell tied the club record with six field goals, and Ben Roethlisberger threw a touchdown pass in the fourth quarter. The Steelers (9-5) have won five straight and can clinch the AFC North title with a victory at home next Sunday against Baltimore (8-6). As a first step, they rallied from a 14-point deficit - kick by kick - and eliminated the defending champions at a place where they’re right at home. They beat the Bengals (5-8-1) in the opening round of the playoffs 18-16 last January, getting the winning field goal with the help of penalties on Vontaze Burfict and Adam “Pacman” Jones. Burfict and Jones each got a personal foul on Sunday - Pittsburgh’s Marcus Gilbert had one as well - as the animosity continued. So did the Steelers’ dominance at Paul Brown Stadium, where they’ve won four in a row. Boswell accounted for Pittsburgh’s first 15 points with kicks from 45, 49, 49, 40, 49 and 30 yards. In the end, there was another Bengals meltdown. They had penalties on four consecutive plays - including Pat Sims’ personal foul - that set up Roethlisberger’s 24-yard touchdown pass to Eli Rogers for a 24-20 lead. BALTIMORE -- The Ravens survived a desperate comeback bid by the Eagles, stopping a 2-point conversion with 4 seconds left. On a wet and windy day, the Ravens maintained control of their playoff possibilities. If Baltimore defeats Pittsburgh on Christmas Day and Cincinnati in the regular-season finale, the Ravens will enter the postseason as AFC North champions. Baltimore (8-6) led 27-17 with just over six minutes left when Joe Flacco threw an interception inside the Philadelphia 10 to give the Eagles (5-9) another chance. The Eagles got the ball back at their 41 with 1:39 to go. A 24-yard completion to Zach Ertz and a pass interference call against rookie Tavon Young set up a 4-yard touchdown run by Wentz that got Philadelphia within a point. First-year coach Doug Pederson went for the win. Wentz threw over the middle to Jordan Matthews, who couldn’t get his hands on a ball that appeared to be tipped. EAST RUTHERFORD, N.J. -- Odell Beckham Jr. made another one-hand touchdown catch to delight replay fanatics, the defense turned in another stifling performance and the Giants inched closer to their first playoff berth since 2011. The win was the eighth in nine games for the Giants (10-4) and it gave them their best record through 14 games since 2008, when they were 11-3. The formula was the one the team has followed in Ben McAdoo’s first season: just enough offense and a tough stingy, pass-rushing defense. That unit has come up with big back-to-back performances against two division leaders in Dallas (11-2) and Detroit, giving up 13 total points. Eli Manning (20 of 28 for 201 yards) threw a 6-yard touchdown pass to Sterling Shepard on a 75-yard opening drive. He then iced the game with a 4-yarder that Beckham caught with his left hand and then pranced into the end zone for a 11-point lead with 5:20 to play. ATLANTA -- Devonta Freeman ran for three touchdowns, Matt Ryan passed for two more and the Falcons clinched their first winning season since 2012. The Falcons (9-5) made sure they didn’t overlook the 49ers (1-13), moving a step closer to getting back to the playoffs after a three-season absence. GLENDALE, Ariz. -- Drew Brees snapped out of a two-game funk to throw for 389 yards and four touchdowns in the highest-scoring game in the NFL this season. Brees, who had no TDs and six interceptions his previous two games, completed 37 of 48 with no picks. MINNEAPOLIS -- Andrew Luck threw for 250 yards and two touchdowns, Robert Turbin rushed for two touchdowns, Mike Adams forced a fumble and added an interception for the Colts (7-7). Frank Gore rushed for 101 yards and Indianapolis won on the road for the fourth time this season, dominating a Vikings defense that has been among the best in the league. The Vikings believed they needed to win the final three games to make the playoffs. Sam Bradford threw for 291 yards with one interception and one lost fumble for Minnesota. After a critical home loss to Houston last week, the Colts trail the Texans and Titans by one game in the AFC South.